I get that. It’s cold and I want a blue cheese burger, fries, and a few glasses of wine. But in a weird way I’ve also been craving something healthier, to get a tiny bit of that summer feeling. And this quinoa dish is also incredibly hearty and filling. The flavors are so light and summery, a bright spot in the chilly, rainy winter we’re having. This recipe was also very easy to throw together, and great as leftovers as well. I used a mixture of both red and white quinoa since I had them both on-hand, but you could use either separately as well. 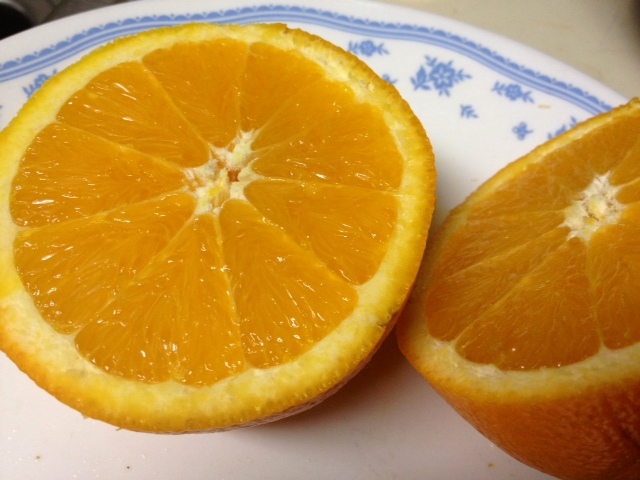 Using a vegetable peeler, remove a 3-inch strip of peel from the orange. 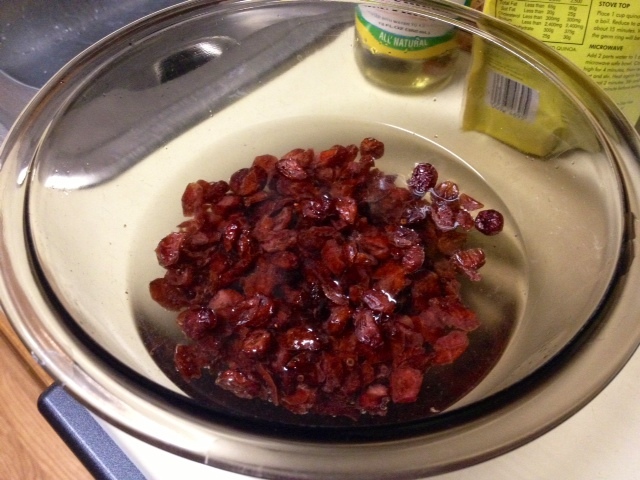 Also, combine raisins, cherries and 1 cup of hot water in a bowl, and let stand for 15 minutes. Drain the water and set aside. I only had Craisins and dried cranberries sweetened with cherry juice (which is kind of like cherries, right? ), so I used those. Back to the orange. Place the peel and 1 1/4 cups of water in a medium saucepan with about half a teaspoon of salt. Bring to a boil over medium-high heat. Then reduce the heat to low and stir in the quinoa, ginger, cinnamon and coriander (I didn’t have, so I used cumin). 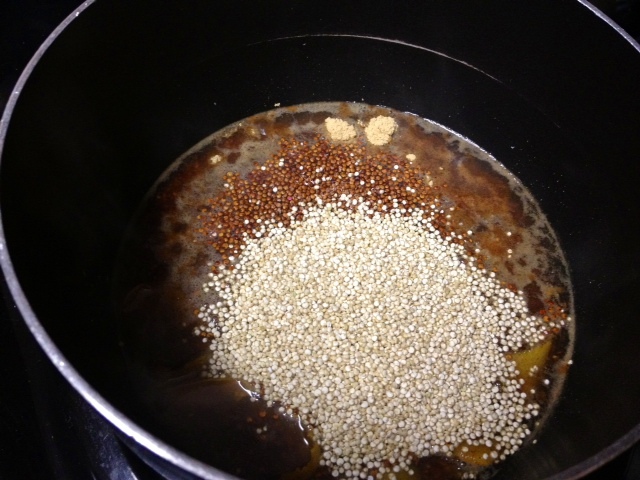 Cover and cook for 15 to 20 minutes, or until the quinoa is tender. 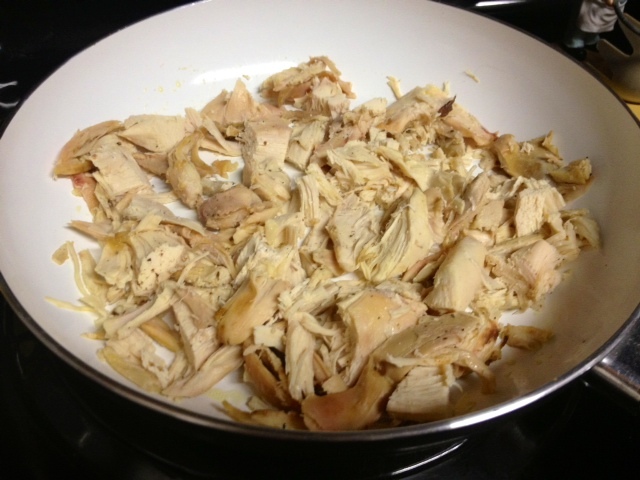 My rotisserie chicken had been frozen, so I thawed in the microwave and then heated in a pan with a little olive oil and salt and pepper. 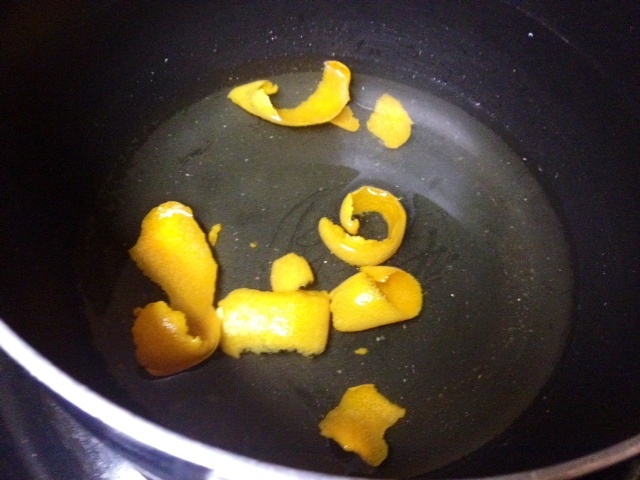 In a small bowl, finely grate the remaining orange peel, cut the orange in half and squeeze out all the juice. Then whisk together with the oil and vinegar. 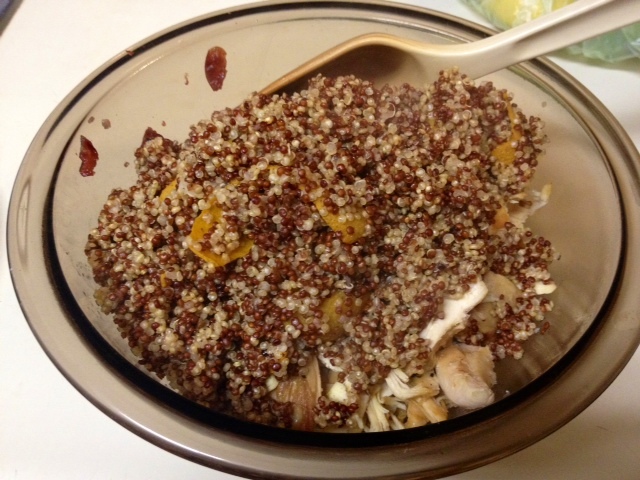 Remove the quinoa from heat and discard the orange peel, if you’re one of the people who follow the rules. Or, if you’re lazy like me, just leave them in and pick them out as you eat. 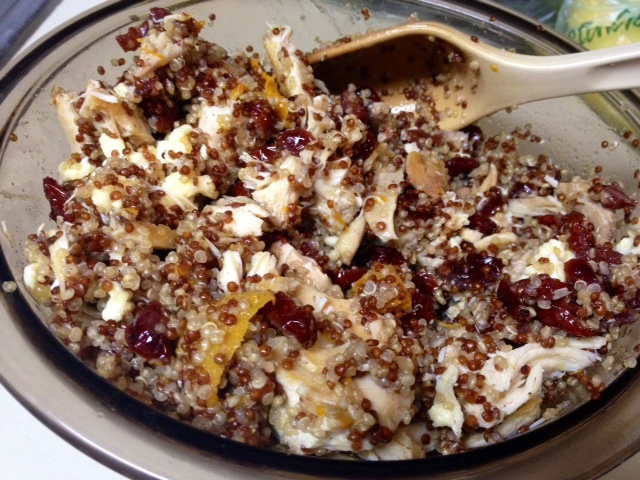 Pour the quinoa into a large bowl with the raisins, cherries, and chicken. Finally, drizzle the dressing over the cooked quinoa mixture, and toss to coat. Serve right away, then pat yourself on the back for making such an awesome, healthy choice in the dark, cold days of February. This stuff is great fresh or leftover, and made me really full and satisfied! 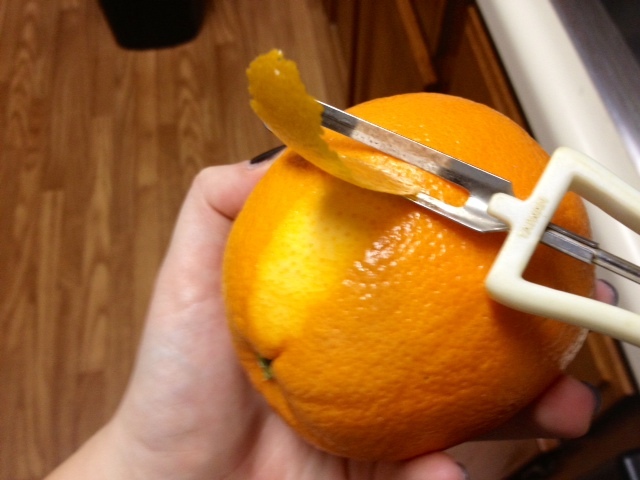 Using a vegetable peeler, remove a 3-inch strip of peel from the orange. 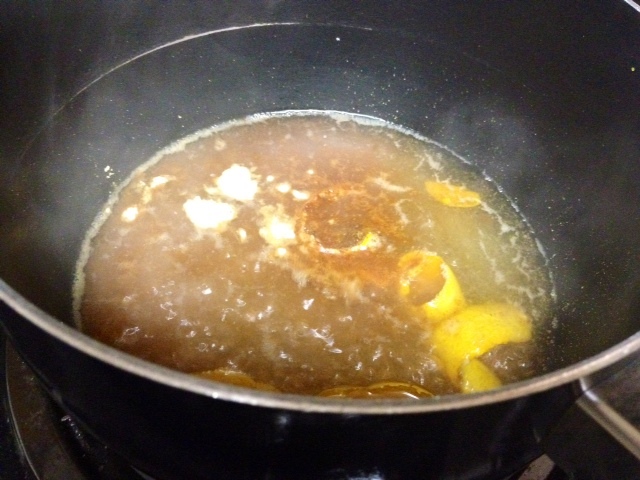 Place the peel and 1 1/4 cups of water in a medium saucepan along with about half a teaspoon of salt. Bring the water to boiling over medium-high heat. Then reduce the heat to low and stir in the quinoa, ginger, cinnamon and coriander. Cover and cook for 15 to 20 minutes, or until quinoa is tender. Meanwhile, in a medium bowl, combine raisins, cherries and 1 cup of hot water; let stand for 15 minutes, then drain the water out. 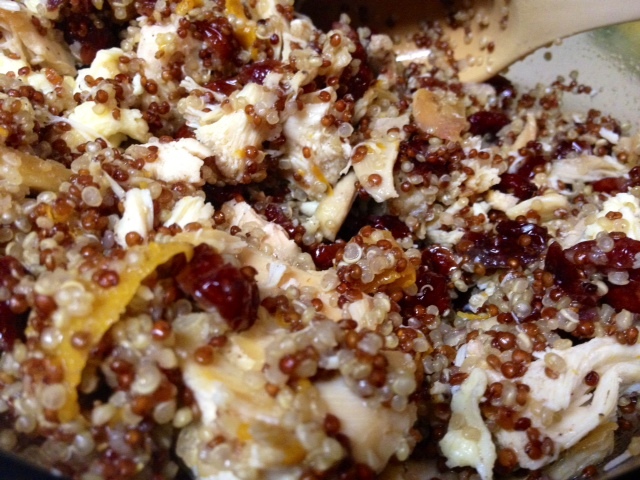 Remove the quinoa from heat and discard the orange peel (or if you’re lazy like me, leave them in and just pick them out as you eat). 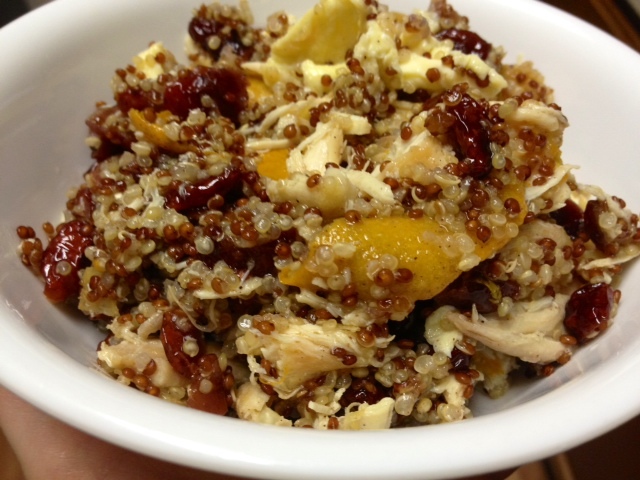 In a large bowl, combine quinoa, raisins, cherries and chicken. 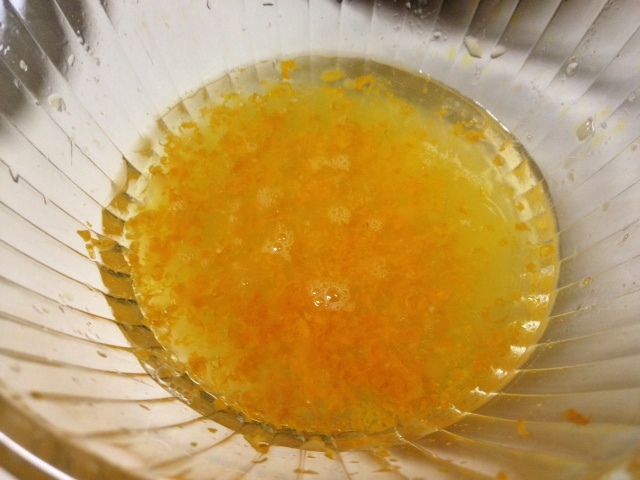 In a small bowl, finely grate the remaining orange peel, cut the orange in half and squeeze out all the juice, and whisk together with the oil and vinegar. 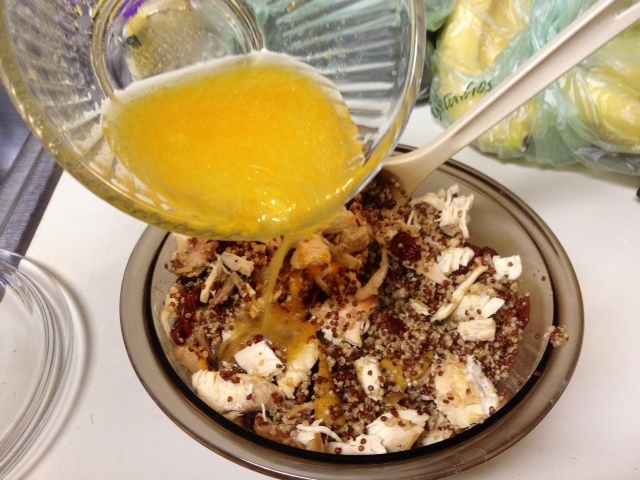 Drizzle this dressing over the cooked quinoa mixture, and toss to coat. Serve immediately.